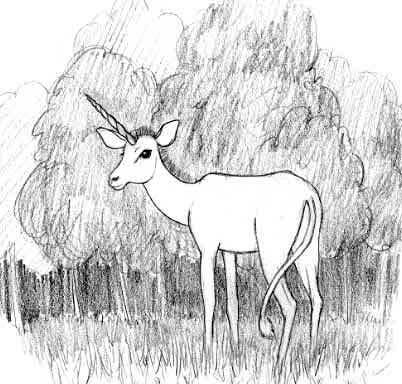 The Unicorn of mythology was originally a much smaller creature than a horse, and was related to the goat or deer. She was a very secretive woodland creature, and her horn could cure humans who had been poisoned. She had the tail of a lion. In mythology she was associated with purity and truth. According to a 12th century Latin Bestiary, there were actually two types of unicorn – one “solid-footed”, like a horse or donkey, and the other “cloven-footed”, like a deer. 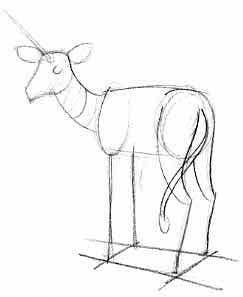 Now, let’s learn how to draw a magical unicorn! 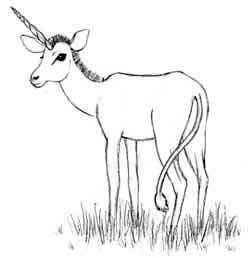 Just for fun, I think we’ll draw a deer-like Unicorn, with the body and head of the beautiful impala from Africa, adding the lion’s tail, and borrowing the horn from the narwhal. (Actually, the narwhal has a tusk, not a horn, but we’re still going to borrow it!) If you prefer the horse-like sort of unicorn, like the one who’s portrait is on the Introduction page, you will probably want to surf the web for pictures of Arabian horses. 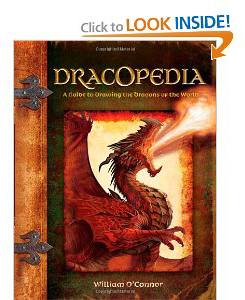 I was unable to find a picture of a narwhal tusk that I could use for this eBook, but you can see them if you go to a website that actually sells them, at http://www.arcticartsales.com/galleryV.html. Supposedly, in ancient times sailors brought back the narwhal tusks and sold them to wealthy Europeans as horns from the Unicorn, thereby greatly increasing their price. What we don’t know is if the idea of the Unicorn came from the narwhal tusks, or whether the sailors just used an old myth for their profit. Either way, it makes an interesting story. Since a lion’s tail looks like a rope with a hunk of fur on the end, we can make that part up. A Unicorn, like a horse, is a fairly difficult animal to draw. The shapes are not covered in feathers or heavy fur, so we need to pay a lot of attention to the actual lines of the legs, and keep the proportions right. I started by drawing a fat tube for the body, then adding the legs and a curving tube for the neck. I have drawn a grid on the ground so that I’ll get the feet in the right place. 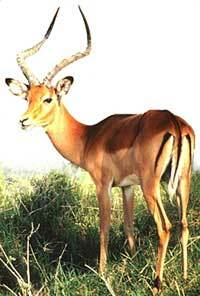 The impala’s face is slightly dished, like an Arabian horse. She also has nice chubby cheeks. The face is always a very important part of a drawing of any animal, so we should spend a lot of time getting it the way we want it. And most of the expression is in the eyes. If you looked at the narwhal tusks, you know that the Unicorn’s horn has a beautiful twist (much like the impala’s horns, without the curve). 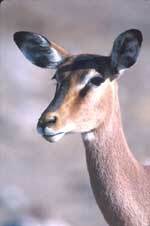 Real deer have horns that come from bumps on the tops of their heads, just like their cousin the cow. But the Unicorn is usually thought to have a horn coming from it’s forehead. Now we concentrate on drawing the curves of the body and legs. 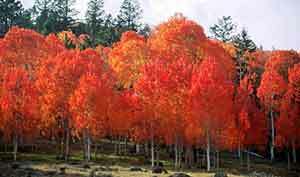 Pay special attention to how each part relates to the other parts, and how they are proportioned. Remember, it isn’t cheating to measure things. Just for fun, I borrowed the mane from a zebra. I think it gives our Unicorn a nice punk look, don’t you? She’s almost finished now, except that the impala lives on grassland, but our Unicorn lives in the woods. So I think I’ll sketch in some trees behind her, but leave the Unicorn white, so she stands out. I won’t put much detail into the trees, just sketching in a suggestion of them. Wouldn’t my drawing be pretty if I had some colored pencils? You might want to using some color in your drawing. 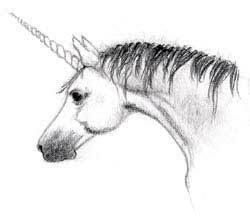 For those of you who like the idea of using a horse for a unicorn model instead, here’s another unicorn drawing – this one is modeled after a prize Arabian stallion.